Guntur MP Galla Jayadev staged a dharna outside the collector's office late Tuesday night after the IT sleuths raided his residences. 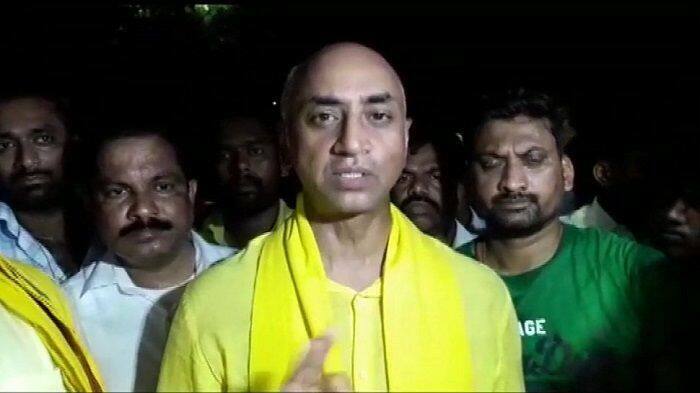 New Delhi: Hours after Income tax sleuths raided Telugu Desam Party (TDP) MP Galla Jayadev’s properties, the MP staged a dharna and walked up to the Guntur collector’s office in protest against the ‘crackdown’. Galla, an industrialist and the managing director of Amara Raja Group, was the richest candidate in the 2014 Lok Sabha election. He’s the face of TDP’s attack against NDA over the issue of special status for Andhra Pradesh. “Why is TDP being targeted in Andhra Pradesh? If EC and all government agencies are working impartially it should be happening to people of all parties. This is an attempt by the government to influence the elections. We are moving towards a state of emergency in the country,” Galla claimed to news agency ANI. Earlier on Tuesday, Andhra Pradesh Chief Minister N Chandrababu Naidu had alleged that various leaders, including the Prime Minister, are “acting vindictively” against the state.